Time flies and it is again my turn to create an art response to a ZNE members artwork as part of my ZNE Design Team challenges. I think this is my favorite part of our work. There are so many wonderful pieces of work to inspire the creativity inside. The piece I chose for this weeks See It, Say It Saturday, was created by my dear childhood friend, Laurie Blau-Marshall, http://loudlife-laurieblaumarshall.blogspot.com/ I thank God that she chose to hyphenate her last name, or I might not have figured out who she was when we were both chosen for ZNE’s inaugural Design Team. What a happy day that was to discover each other again after 20+ years of being apart. Then to find out we are doing the same type of art and belong to the same group of artists and are on the same DT, was just unreal. It still gives me goosebumps to think about it. 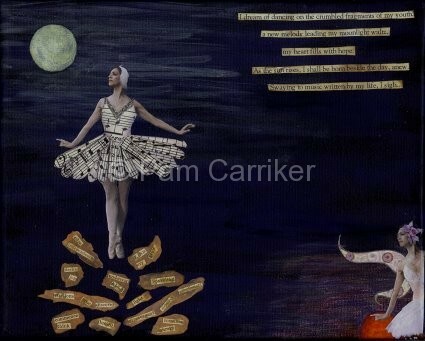 As for Laurie’s inspiration piece, I just loved the dark look to this piece, and the classy feel of the ballerina. Laurie always finds the right words for everything. She writes lovely poetry as well as creating wonderful works of art. This poem is a Renga, or group poem, written by a team from ZNE’s Artists and Poets group and Laurie wrote the first line. 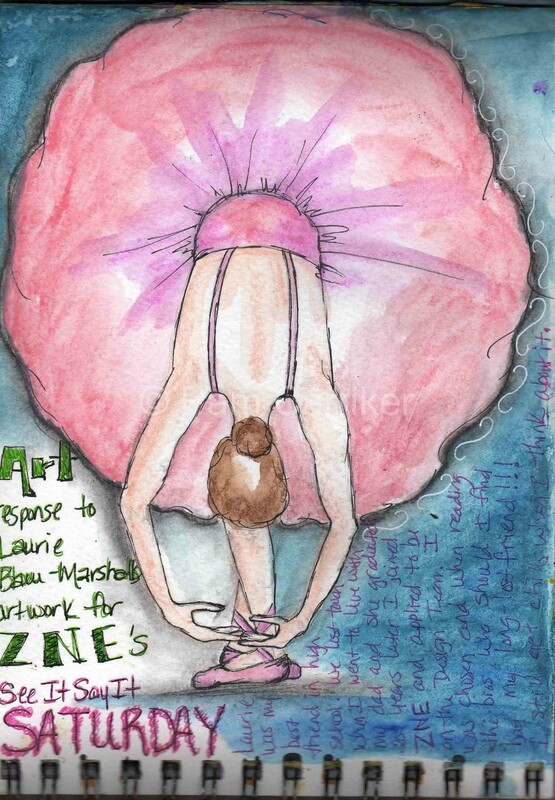 (The ballerina is Margot Fonteyn) My response to her work started with this journal page way back when we had to choose our inspiring art pieces. Her ballerina is dancing and I liked the idea of my ballerina bowing to her work. ‘Wistful Glories’ was created on a 12x12x2″ canvas using acrylics, water soluble crayons, charcoal, paper, ink, stamps and graphite. This piece is in my dining room on an easel right now. I really was pleased with it and want to enjoy it while I can. I have it listed in my Etsy shop, but it will be a hard one to part with. I think that all of us have a longing to be a graceful ballerina at some point in our childhood. 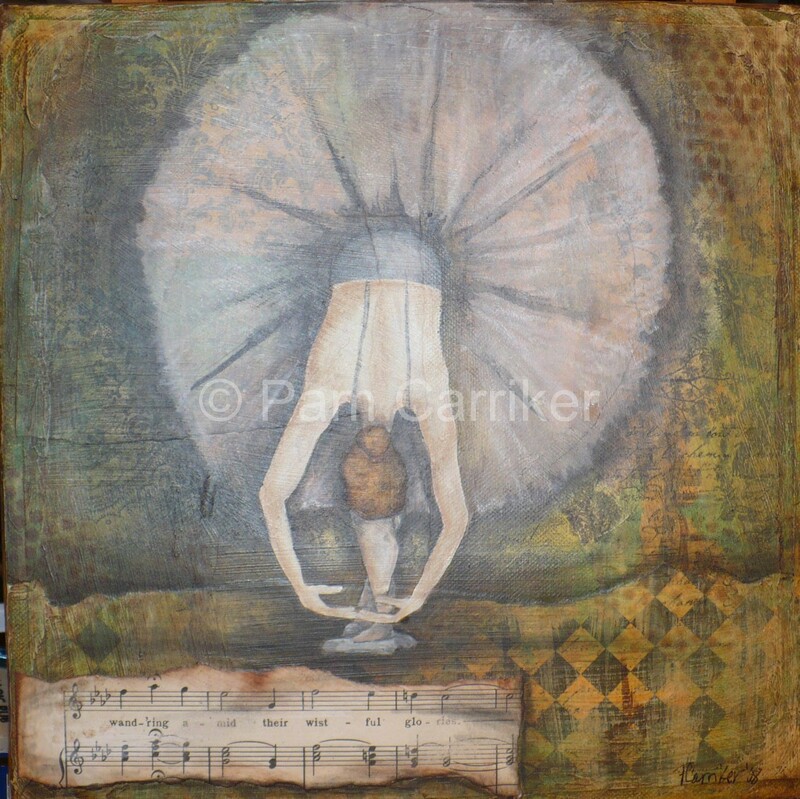 This piece was recently in an Etsy Treasury with other ballet themed work. It was a huge compliment to me as the treasury was so lovely. I encourage you to check out the See It, Say It, Saturday on ZNE and create your own art response to Laurie’s wonderful work. Thanks for being an inspiration both in art and life my friend! 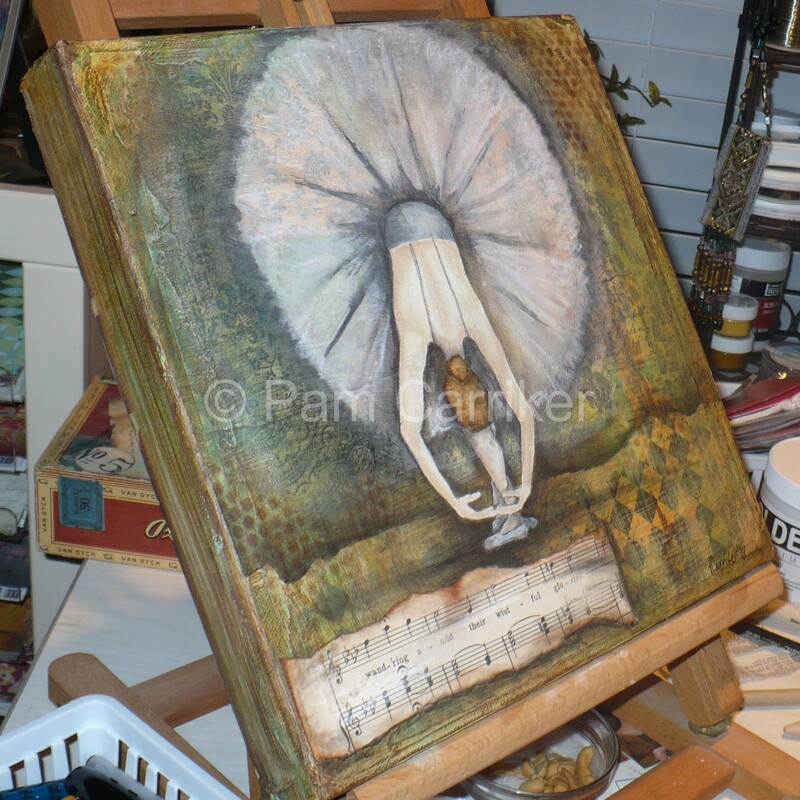 I love the painted ballerina, but I absolutely love love love the journal page. I guess I’m more attracted to colorful pieces. Have you thought of turning that into a painting, too?Your work is lovely, and I spend lots of time examining your backgrounds because they are so complex!